But as soon as there is more than one note sounding at a time, you have harmony. Even if nobody is actually playing chords, or even if the notes are part of independent contrapuntal lines, you can hear the relationship of any notes that happen at the same time, and it is this relationship that makes the harmony. 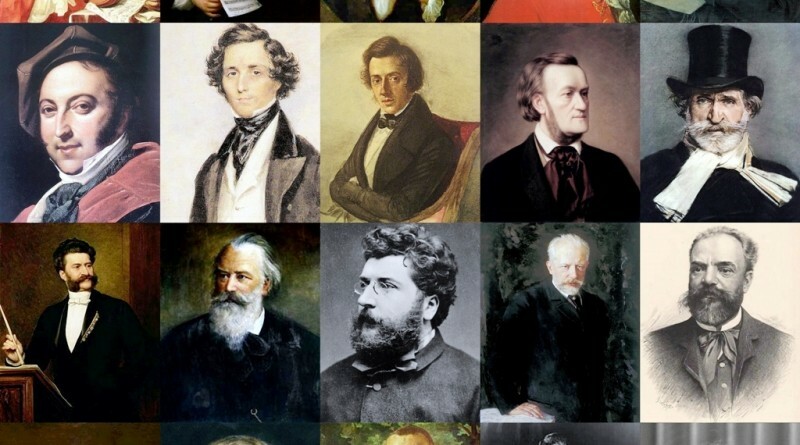 Harmony is one of the most interesting and complex issues in Western music, and can be the subject of an entire course on music theory. Many of these concepts are explained in greater detail elsewhere, but here are some basic terms and short definitions that you may find useful in discussions of harmony. A melody all by itself (monophony) can have an implied harmony, even if no other notes are sounding at the same time. In other words, the melody can be constructed so that it strongly suggests a harmony that could accompany it. For example, when you sing a melody by itself, you may be able to “hear” in your mind the chords that usually go with it. The simplest way to add harmony to a melody is to play it with drones. A drone is a note that changes rarely or not at all. Drones can be most easily found in bagpipes music, Indian classical music and other music that use instruments that traditionally play drone notes. Homophony is a texture of music in which there is one line that is obviously the melody. The rest of the notes are harmony and accompaniment. 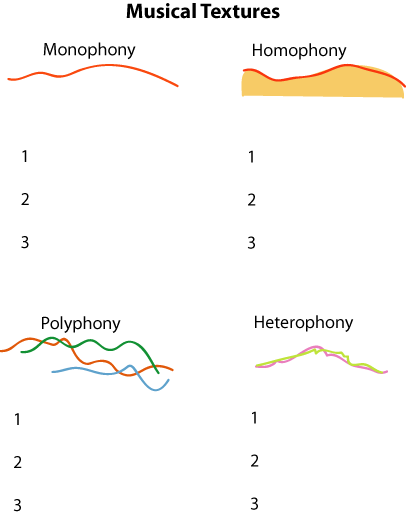 Polyphony or counterpoint – Both of these terms refer to a texture of music in which there is more than one independent line at the same time and they are all fairly equal melodies. In Western music, most harmony is based on chords. Chords are groups of notes built on major or minor triads. In traditional triadic chords, there are always at least three notes in a chord (there can be more than three), but some of the notes may be left out and only “implied” by the harmony. The notes of the chord may be played at the same time, or may overlap, or may be played separately but in a quick enough succession that they will be “heard” as a chord. 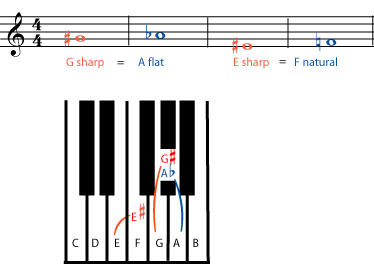 measure of A minor and a half measure of D seventh”, or just “G, A minor, D seventh”) or more generally of classes of chord progressions (for example a “blues chord progression”). Please see Harmonic Analysis for more information. The harmonic rhythm of a piece refers to how often the chords change. Music in which the chords change rarely has a slow harmonic rhythm. Music in which the chords change often has a fast harmonic rhythm. A cadence is a point where the music feels as if it has come to a temporary or permanent stopping point. 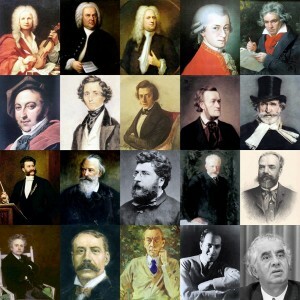 In most Western music, cadence is tied very strongly to the harmony. For example, most listeners will feel that the strongest, most satisfying ending to a piece of music involves a dominant chord followed by a tonic chord. In fact, a song that does not end on the tonic will sound quite unsettled to most people. 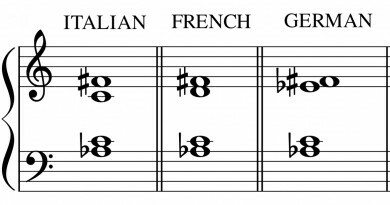 Diatonic harmony stays in a particular major or minor key chromatic – Chromatic harmony includes notes and chords that are not in the key and so contains many accidentals. A dissonance is a note, chord, or interval that does not fit into the triadic harmonies that we have learned to expect from music. A dissonance may sound surprising, jarring, even unpleasant. All the parts of the music that are not melody are part of the accompaniment. This includes rhythmic parts, harmonies, the bass line, and chords. This is just another term for the string of notes that make up the melody. The bass line is the string of notes that are the lowest notes being sung or played. Because of basic laws of physics, the bass line sets up the harmonics that all the other parts – including the melody – must fit into. This makes it a very important line both for tuning and for the harmony. The bass line also often outlines the chord progression, and it is often the most noticeable line of the accompaniment. Accompaniment parts that fill in the music in between the melody (which is often the highest part) and the bass line. The melody is not always the highest line in the music. Attention is naturally drawn to high notes, so a part that is higher than the melody is sometimes given a special name such as “descant”. This term is an old one going all the way back to when harmonies first began to be added to medieval chant. See countermelodies for more about descants.